Replacing the much-loved Land Rover Discovery 4 was never going to be an easy task. The fact that the new Disco isn’t just as good, but even better, speaks volumes for the rude health and ambition of Land Rover today. Yet it can still tow up to 3,500kg, it can be surprisingly economical and it’s now a genuine seven-seater. Yes, that’s right, seven adults can now undertake a journey in this superb SUV. It’s still tall and the roofline gently rises to the rear again in order to accommodate stadium-style seating, while the signature clamshell bonnet is there too, along with reverse C-pillars. The Disco 5’s slabby rear end may well be divisive, but remember, that awkward off-set number plate also featured on the old car. 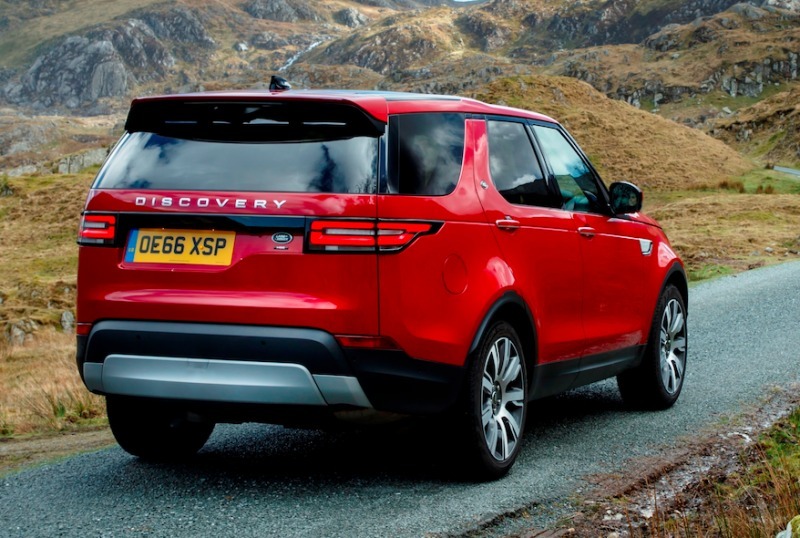 The fifth-gen Discovery also gets a top-hinged single tailgate, losing the popular two-piece, but there is still a ledge to sit on for picnics and changing your wellies. The new Discovery is 4970mm long, 2220mm wide (including the mirrors) and 1846mm tall, meaning it’s slightly longer, narrower and lower than the vehicle it replaces. Crucially, the wheelbase is a fraction longer, which boosts passenger space, while liberal use of aluminium means the whole cars weighs up to 480kg less than the Disco 4, depending on which engine you opt for. Inside, the Discovery has moved upmarket and it’s definitely plusher than its more utilitarian early days 28 years and 1.2 million-plus vehicles ago. Priced from £43,995 to £65,695, there are four main specs – S, SE, HSE and HSE Luxury – and even the entry-level model gets heated door mirrors, autonomous emergency braking, lane departure warning, air conditioning and the latest 8-inch touchscreen InControl infotainment system. 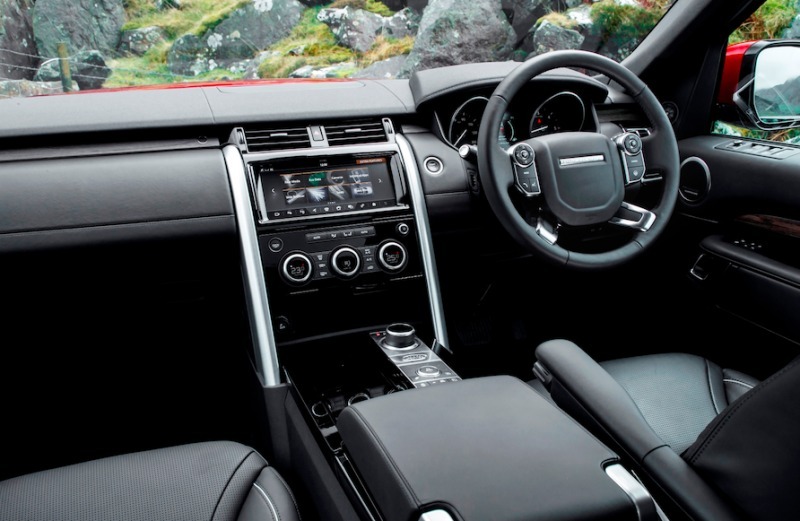 Upgrading to SE adds leather upholstery, sat nav, LED headlights, electrically adjustable and heated front seats and dual-zone climate control. While HSE models gain a panoramic roof, a reversing camera, heated rear seats and a 10-inch touchscreen.. Plump for the range-topping HSE Luxury and you get a rear entertainment package, a 360-degree camera system, four-zone climate control and an impressive Meridian sound system. Naturally, there’s still a commanding driving position at the front and it definitely has a command centre feel to it. There’s plenty of space behind too, and it’s just a case of flipping one of the outer seats in order to gain access to the third row. 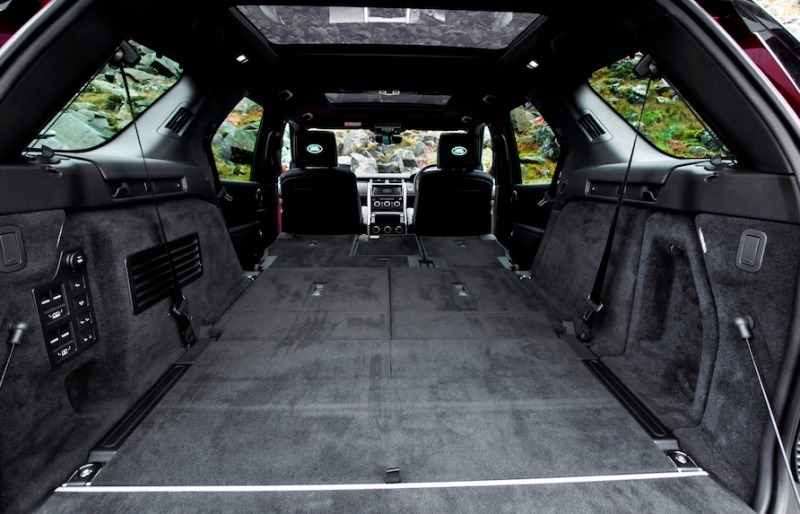 The Discovery oozes stowage areas throughout the cabin and soaks up luggage with 1,137 litres of space behind the second row and up to 2,406 litres when all rear seats are folded. I’m just under six-foot and I managed to sit in the third row. However, for longer journeys the second row might have to be pushed forward slightly. Impressive, especially when you consider that seats six and seven are strictly for small people in many rivals (the Volvo XC90 and Audi Q7 to name but two). Talking of seats, you can even control and configure them remotely with your smartphone. There are three engines available – a four-cylinder diesel for the first time, the much-loved 254bhp V6 diesel, plus a 340bhp 3.0-litre V6 petrol. I tried both diesels and though the V6 is smooth and powerful – and sounds glorious – the new twin-turbo 237bhp version of the Ingenium 2.0-litre diesel unit is a revelation. More refined than in any other Jaguar or Land Rover, it pulls well and was more than adequate off-road too. Unless towing is your priority, it makes absolute sense. It’s also more economical – it’s capable of up to 43.5mpg with CO2 emissions of 171g/km, while the 3.0-litre only manages 39.2mpg with CO2 emissions of 189g/km. Both diesels are surprisingly quick off the mark too – 7.7 seconds in the 3.0-litre and 8.0 seconds in the four-cylinder. Of course, the supercharged V6 petrol is slick and full of beans (0-60mph in just 6.9 seconds), though fuel economy dips to 26mpg CO2 emissions shoot up to 254g/km. All the engines are paired with the excellent eight-speed ZF automatic gearbox. The Discovery drives better than ever too. Depending on which model you opt for, it definitely feels more agile, while the ride is seriously smooth. However, it’s tall and clearly more set up for comfort because there’s a fair amount of body lean if you push it into the corners on more challenging roads. You soon get used to it though, just like a Range Rover, while cruising is an utter joy. But here’s the thing. The 2.0-litre seems to be more planted and it’s definitely the combination I’d go for. 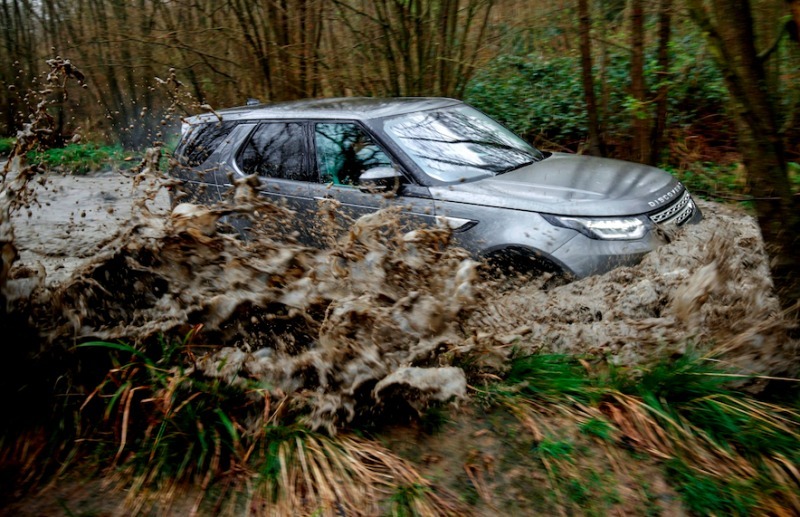 To fully appreciate the Discovery, it’s worth sampling its all-terrain ability at one of Land Rover’s experience centres. With a maximum ground clearance of 283mm and 500mm of wheel articulation, it quite simply ploughs over, round and through obstacles at the most amazing angles, while water challenges are a doddle thanks to its 900mm wading ability. Meanwhile, the reversing camera system is a very useful addition to the Discovery. It makes the big 4×4 much easier to maneuver, particually when driving (and parking) throughout the city. It boasts all manner of Terrain Response gizmos depending on the challenges faced and progress is effortless. One other technical development deserves a mention. If you tow regularly, you might be tempted by the clever Advanced Tow Assist which allows drivers to use the controller in the console between the front seats to reverse a trailer, caravan and horsebox with ease using guidelines overlaid in the rear-facing camera displayed on the touchscreen. The new Land Rover Discovery is, without doubt, one of the world’s most capable cars. It looks modern, it’s supreme off-road, a comfortable cruiser on the road, plus it’s safe and luxurious. Quite simply, a legend reborn.